Searching for a new Oki toner cartridge does not have to leave you strapped for cash. We've got a lower price promise so our toner cartridges for the Oki C3600 laser printer are astonishingly inexpensive. Not only are we very affordable on the price of Oki C3600 toners, we also place a great emphasis on cartridge quality. You can forget spending overpriced high street prices. We think you should never have to compromise on build quality to buy a reasonably priced Oki C3600 printer cartridge. For that reason, we offer you our guarantee so there's no reason to be left disappointed. Here at Cartridge Save we're focussed to help you save money without having to sacrifice on build quality. Buy today on Cartridge Save to save money! With the Oki C3600, users are given the privilege of using colour toner or black toner only when required, so they save more. The Oki C3600 colour LED printer can be shared by a small network, making it a good addition for mini work groups. Speed is not compromised despite the complexity of documents. However, it is not the most lightweight or smallest device available in its class. The Oki C3600 is a single-function device with not an oversized frame. It is approximately 21kg heavy and measures 371x290x478mm, making it slightly larger than its competition. USB and Ethernet ports are at the rear for PC and network connections, respectively. 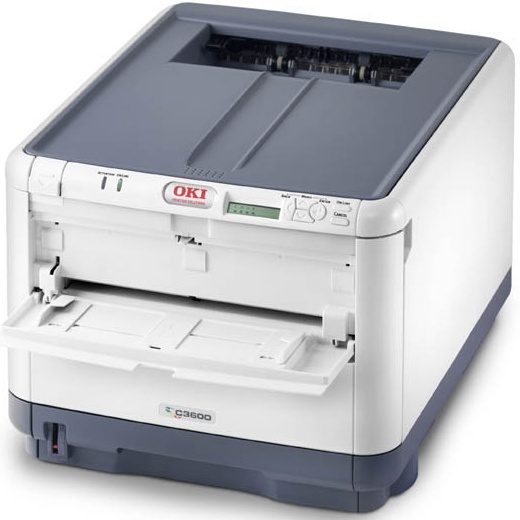 The Oki C3600 colour laser printer runs on a 400MHz processor with 128MB of RAM. Speed and overall print quality are impressive with the Oki C-3600, making it one of the most efficient colour laser printers around. It is network-ready and easy to install in USB-compatible computers. The fast processor and generous memory makes the Oki C3600 printer efficient for bigger print jobs, and the standard memory is upgradeable to 640MB. Oki provides high-capacity toner cartridges for the C3600 printer to help reduce the running costs over an extended period of time. The Oki C3600 laser printer is mostly criticised for its size, which is heavy and quite bulky for something that claims to be compact for a small business. The absence of Wi-Fi connectivity can be a hassle for small offices that want to reduce cable clutter. Direct printing is impossible from digital cameras, and there are no media card slots. The Oki C3600 is not the best choice for photo printing because of pixelated image quality and slightly smudged appearance.